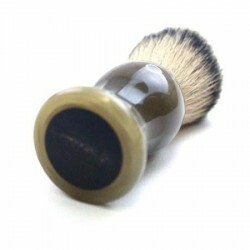 We’re very pleased to add these brushes to our range - exclusive to us they are hand-made in England to exacting standards of workmanship by a highly talented craftsman, using only the finest materials in the best tradition of gentleman’s grooming. Though brushes may be made of similar materials, each one is slightly different, therefore the photos refer to the actual brush on sale and are not generic. 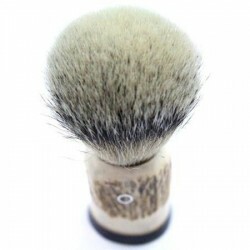 The brushes all use the finest quality, densely-packed knots of Silvertip badger hair, long acknowledged as the best material available for shaving brushes. These are currently of three different sizes, 24/65, 26/65 or 30/67. The first number is the diameter in millimetres of the bristles at their base where they enter the brush handle. The second number denotes the height of the bristles from the base to the tip of the ‘fan’ or ‘mushroom’ of bristles, though please remember that some of the knot is inside the handle. 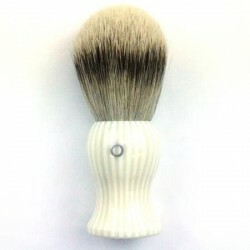 These brushes are also further defined by the unique ‘SilverRing’™ motif which is, not surprisingly, a small ring of silver inset into the side of the brush. Please note that on rare occasions it is not possible to fit these due to handle material restrictions. The brushes are described with the main body material first, any other ‘band’ or ‘fillet’ of material second, and the base insert third. 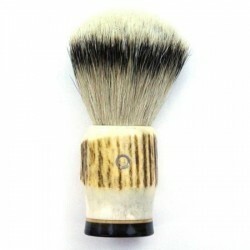 Overall brush height varies slightly dependent on body material used but is always in proportion with the knot. 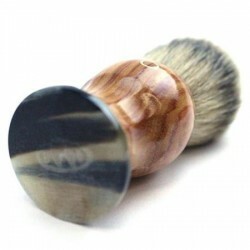 Just a few things to remember about when caring for your SilverRing™ hand-made shaving brush. The bristles are sterilised before use, though a slight odour is common to all natural hair brushes. This will fade with use so please DO NOT boil the brush in an attempt to ‘sanitise it’ - it simply is not necessary and can cause the resin into which the bristles are set to fail. Also, these brushes are neither intended to be washed in a dishwashing machine nor dried in a microwave. Either of these appliances can and will cause catastrophic damage to your brush. 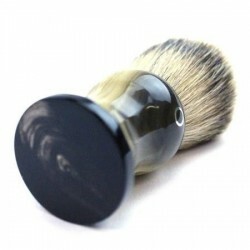 Please do not soak the brush fully immersed as this can also have a negative effect on the finish. It’s perfectly OK to soak the hair, that’s what it is for, but do avoid excess wetting of the brush body. 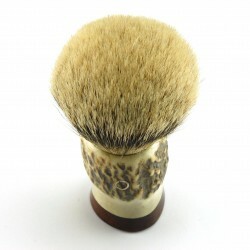 All brushes may shed some hairs at first, and indeed will do so to a much lesser degree during their lifetime. This is not a fault, it’s due to the fact that individual bristles do break now and again and, as the brush has a tightly-packed ‘loft’ when made, there are simply more bristles when new. After use, please rinse the badger hair in clean warm water and shake any excess out. For preference then use a brush stand and leave the brush to dry, bristles pointing downward (this avoids water running to the hair base and possibly causing eventual rotting). If you haven’t got a brush stand, stand the brush on its base in a well-ventilated spot but don’t use artificial heat to dry it. 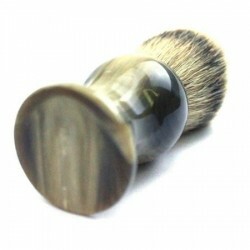 Your brush is an individual, unique piece of shaving equipment that we have made to the most exacting specification we possibly can. It has not been ‘made down to a price’ but ‘up to a quality’ - the same way that our custom razor strops are crafted. With a little care it should last many years and we hope will always be a pleasure to use.